Mountain Flight in NepalMountain flight in Nepal is very popular especially for those who have limited time but wish to explore the magnificent mountains of Nepal. The mountain flight offers panoramic views and exciting experience with breathtaking scenes of the mountains, massifs of the rock and ice. The mountain flight departs from Kathmandu and alongside the Himalayas in order to give you eye-level views of the snow peaks and then brings you back to Kathmadu within a couple of hours. Nepal Adventure Bound Pvt. 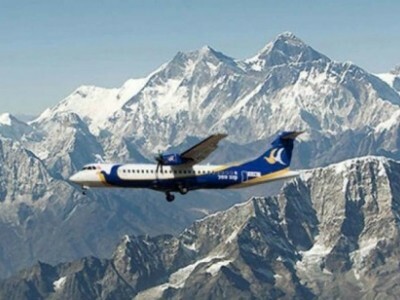 Ltd. Treks and Tour has long been offering mountain flight tour. It has network with various domestic airlines. From the time, the aircraft lifts up and heads towards the east, passengers can spot the white and snow capped-mountains lying from North to South. 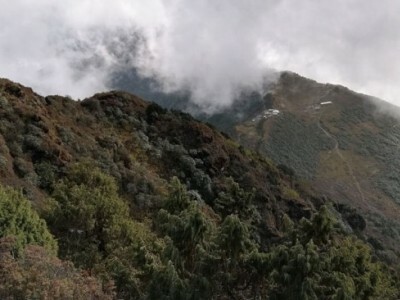 First to their far left visitors can see Gosaithan, also called Shisha Pangma, Standing at the majestic height of (8,013 m) Immediately to the right of Gosaithan, there appears Dorje Lakpa (6,966 m), a mountain that looks like the number 8 lying down and covered with snow. To the right of Dorje Lakpa is Phurbi-Ghyachu, which looms over the Kathmandu Valley. As the plane moves along, the mountains come closer and closer. Next on the vision is Choba-Bhamare, the smallest one of the lot at 5,933 m but singularly stubborn as it has never been climbed. Then, you can see the mountain that is not only prominent in sight but also in spiritually Gauri-Shankar. Lord Shiva and his consort Gauri are said to protect this mountain, at the proud height of 7,134 m and the summit had a history of unsuccessful attempts till 1979. Gauri-Shankar is sharp and very conspicuous during the mountain flight. Similarly, as you move towards the land of the rising sun, the eastern Himalaya a succession of glorious mountains follow you, Melungtse, a Plateau like mountain stretches up to 7,023 m, Chugimago at 6,297 m is still a virgin, waiting to be climbed. At 6,956 m, Numbur Mountain resembles a breast, maternal source in the sky providing pure milk to the Shepas of the Solu Khumbu. Next is Karyolung, an intensely white mountain that at 6,511 m gleams with the rising sun. Cho-Oyu is the eighth highest mountain in the world. Reaching a height of 8,201 m, it appears stunningly beautiful from the aircraft. 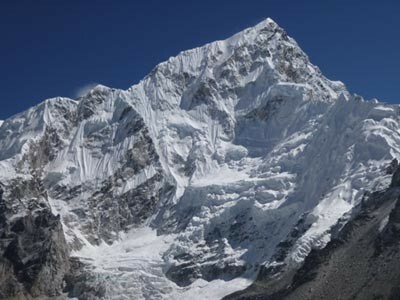 Next Himalaya is Gyanchungkang, at a majestic height of 7,952 m, considered an extremely difficult to climb. To the right of Gyanchungkang is Pumori (7,161m). As you get closer to Everest, you can also spot other mountains such as Nuptse (7,855 m), which means West Peak, signifying its direction from Everest. Finally, theres Everest (8,848m) itself, known as Sagarmatha by the Nepalese and Chomolungma by the Tibetans. Much has already been written about Everest, but to actually witness it face to face during a mountain flight is something else. Even while it looms there in front of the eyes, it remains enigma, this highest spot on earth, after all, the flight returns to Kathmandu airport.